Definition of BISCOTTI : small rectangular twice-baked cookies, typically containing *nuts, made originally in Italy. 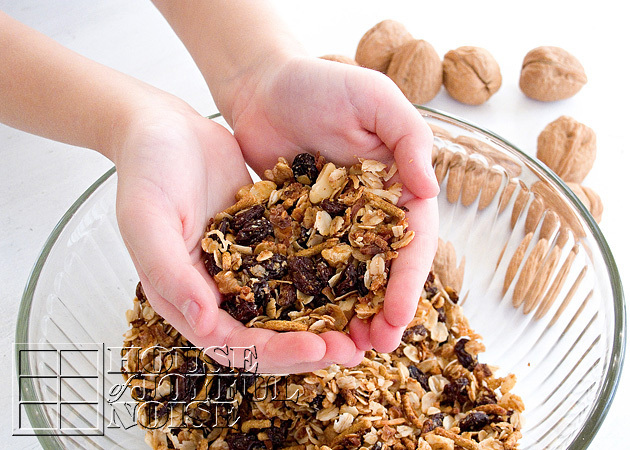 *We omitted nuts, as one in our family has a serious allergy to nuts. Preheat oven to 400 degrees. Lightly grease 2 or more cookie sheets. 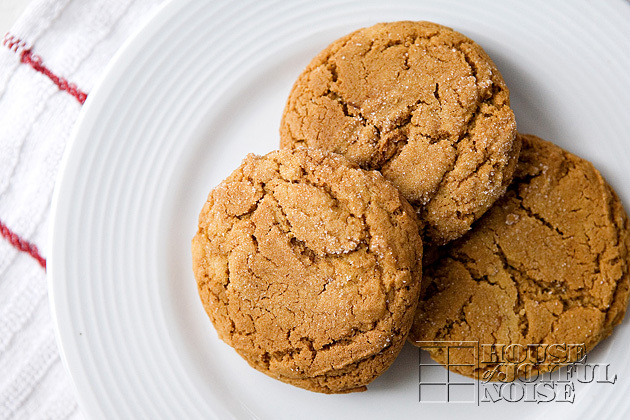 Beat the softened butter with an electric mixer on medium/high speed for 45 seconds to a minute. Add sugar, cocoa powder, and baking powder. Beat until combined. Beat in the eggs until combined. Beat in flour, “If you can’t beat in all the flour, just stir it in.” Stir in the chocolate pieces. 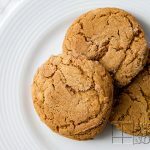 Divide the dough in fourths: shape into four loaves and put them on the cookie sheets, adjusting the thickness and length of them to fit in the cookie sheet but not bake into each other. Preheat oven to 350 degrees. Use a serrated bread knife to cut each loaf into slices, you may cut them as thick or thin as you like. Bake them for 12 to 15 minutes, turn them over on their side, and bake them for another 12 to 15 minutes. 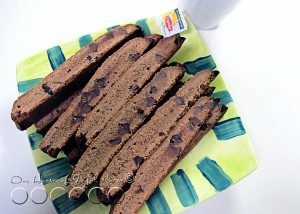 A delightful double-chocolate biscotti cookie recipe, with a dash of facts about biscotti cookies, to further enjoy. 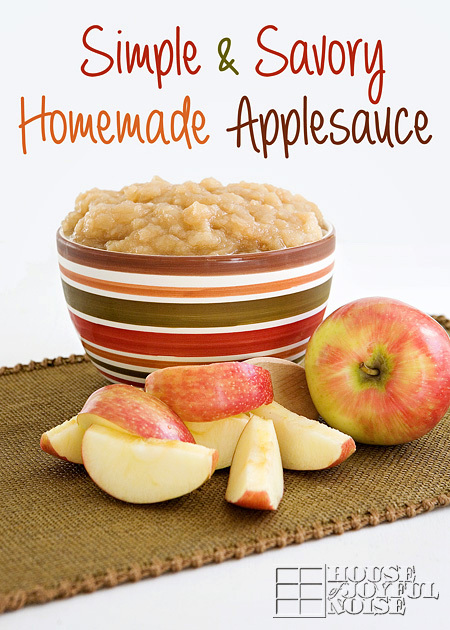 Be sure to grab the printable recipe, before you go! Hope you enjoy, too! 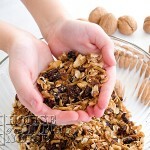 There’s nothing like a snack you can give your kids, and feel good about! 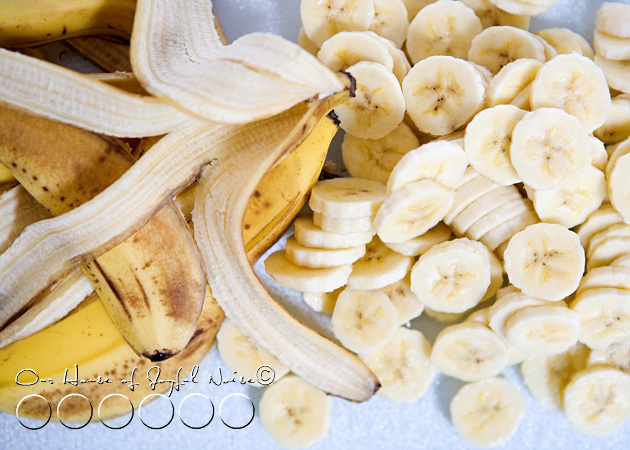 So today, we’re going to show you how to make a simple, healthy and natural snack – Banana Chips! Like most recipes, there are always a few variations or different ways to go about preparing a food. Banana chips can either be fried, or baked. We try to opt for the healthy options first. 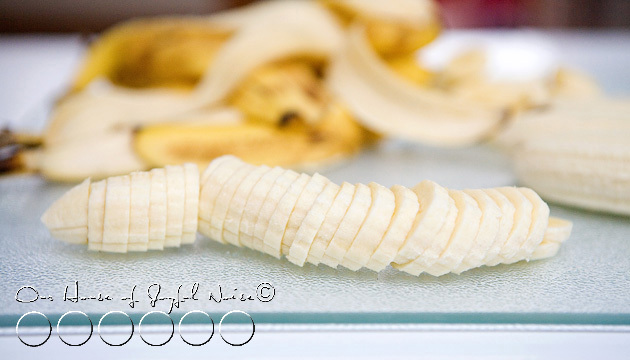 Making baked banana chips really couldn’t be any simpler. Need I say more? Maybe. Some may want to know exactly what to do with them. But I am willing to bet, this is going to go just about how you think it is. 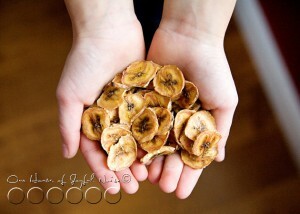 The main thing you need to make banana chips, is a bunch of bananas. But really, if you want a bunch of banana chips, you might want to go with two bunches of bananas. Because they shrink up to nothing, and you may find yourself asking in the end, “That’s all we got? Seriously?” Much like mushrooms, or onions…..you start out with a big pile, get cooking them, and wonder where it all went! But either way….if you cut them or like them a little thicker, you’ll just bake them a little longer, and I’ll get to that. 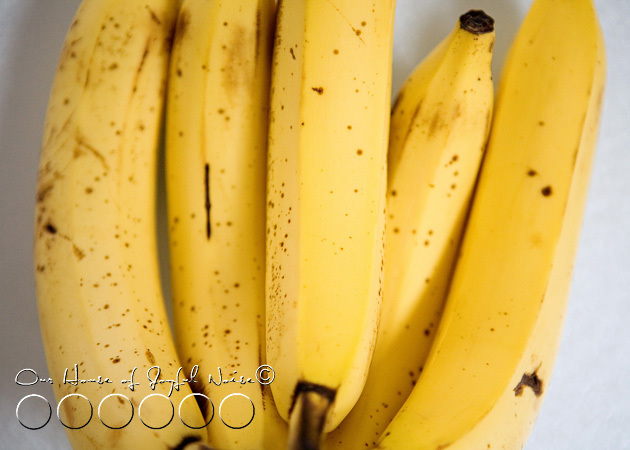 If it’s gardening season, and you garden, remember…..banana peels are a wonderful organic compost ingredient! They are a great source of potassium for the soil. That means excellent nutrients for your producing plants. When burying peels near your rose bushes, you’re bound to get bigger blooms too! But right….we were talking about banana chips. Preheat your oven to ~150 degrees for thinner slices, 200 degrees for thicker. Then, you can lightly grease your pans, or spray oil on them. 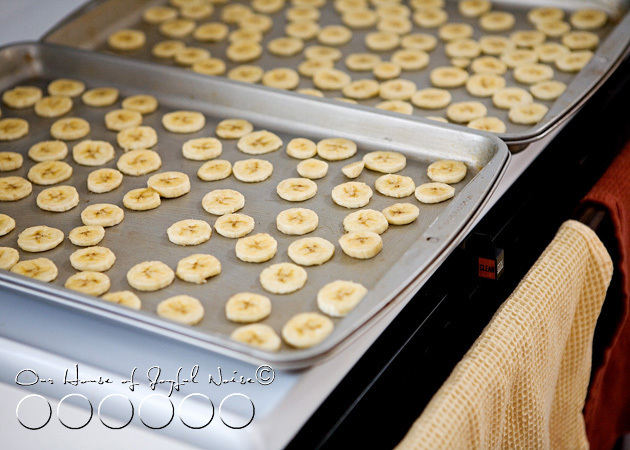 Spread your banana slices on the cookie sheets, not touching. 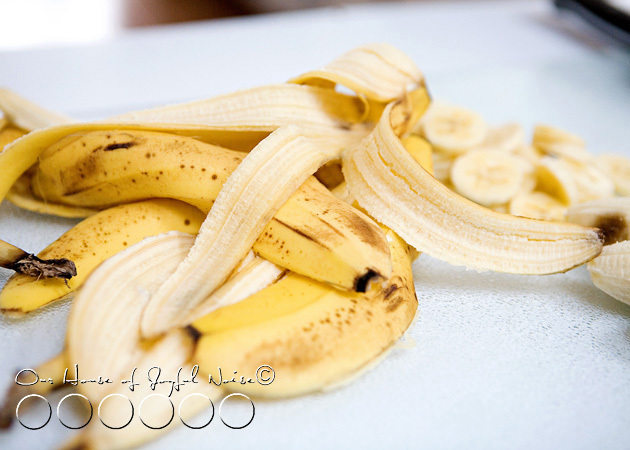 Now, if it’s important to you that the banana slices maintain their color for the most part, and don’t turn too brown, you can spray them with lemon juice. We didn’t care, and I was afraid I would taste the lemon juice. (Not a lemon fan.) So….we skipped that. 1/8″ : 2-3 hours, turning over every 30 minutes or so. When they are dried out and nice and a little golden brown, they are done. Thicker than 1/8: Bake an hour, turn over and check if they are dehydrated yet. If not, put in a little longer. Really……when they are chippy, they are done. You can’t do it wrong, People. (Unless they are still mushy, or burnt. ; ). After that, just leave them out to harden a little more. Then put them in a storage container to keep fresh. Ours came out crunchy at first bite, and then a little fun and chewy. They can be eaten alone, or added to a trail mix. 1) Bananas make you HaPpY!! They contain the natural chemical found in prozac. 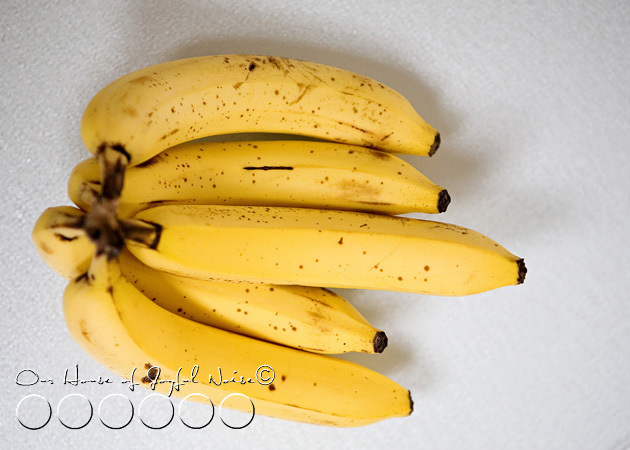 2) Bananas, eaten raw, do not make me happy. Well, they used to make my mouth happy. But then I found, they do not make my stomach happy. After several bouts of excruciating stomach pains, on different occasions, I had always asked myself what I had recently eaten. The common consumption? A banana. I’ve come to the conclusion that my stomach can digest anything under the sun, except raw bananas. Which is a bummer, because I love them. So I make myself feel better with, banana chips!….banana bread…..banana muffins…..banana pancakes…..banana-fanna-fo-fanna….you get the idea. Banana chips (baked) are a healthy, organic snack for the kiddos too! So be sure to share!